The Sim City Planning Guide: The Space Center Great Work-Around! The Space Center Great Work-Around! 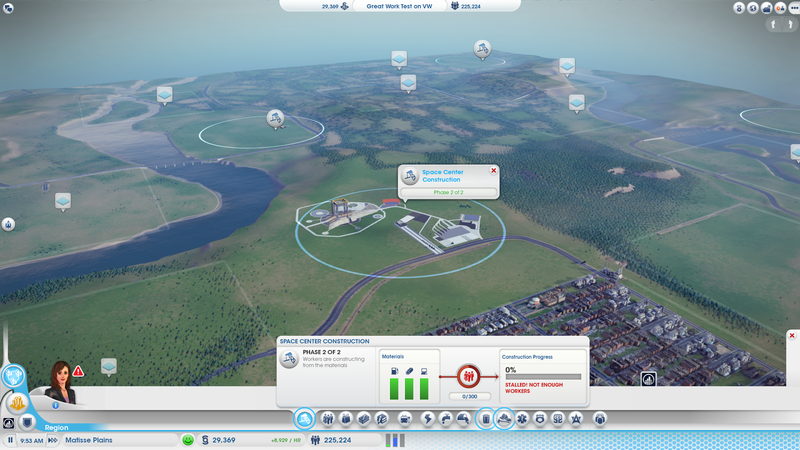 One of the biggest complaints I see for SimCity is that the Space Center Great Work is bugged on certain maps. You can pull a permit, but the 300 workers needed to construct it never arrive to the construction site. 5/17/16 Update: The bug has been fixed by EA. You should no longer run into this problem. I'll leave the text below for reference. This is where it normally gets stuck. No matter how many unemployed workers you have, they just don't make it to the construction site. Alas, a work-around for the bug has been discovered! It was originally found by someone on a Japanese SimCity messageboard and then later described on a Japanese SimCity wiki site. The Space Center Great Work Bug -- Solved! Once you place the 4th leg to the intersection, the 300 workers necessary to build will start arriving. If it doesn't register the workers arriving right away, and you're a little impatient, you can close and restart your game. In the video demonstration below, I exited to the main menu and jumped back to the city three times before it worked. If you're not impatient, you can just let it sit and it should eventually build. Both methods work. The best part about this fix is that it works in both online and offline games. Special thanks goes to Mark Norris from the SimNation Guild who brought this to my attention, tested it out on multiple maps and found that it worked every time. He also found that you can delete the segment after your workers are done building the great work. You can read Mark's comments on the fix below the video. For a video explanation, you can watch the video below. If you're in a city that's far away from the great work site, you'll need to be using "CamModB1" (Download here) so that you can see what you're doing. The normal camera mode makes it difficult to see this location. You'll also need "Skye's Regional Freeway Mod" (Download here). If you're not sure how to install mods, read my Mod Installation Guide. Which Cities will you need to do this? The following is a list of Great Work Plots that either work, or can be made to work, for the Space Center. This list is by no means complete, and only represents the plots that I have personally verified. I'll point out that most of these were done in Online Sandbox mode, and I'm 99.9% sure that it doesn't matter (Discovery Delta - East was done in both Sandbox and non-Sandbox, with the same result). First, if you are seeing workers going to the GW site (by looking at the population overlay) while you are sending resources, you're golden. It's not bugged. For me, the optimal time to add the freeway stub is when you are about 80% done sending resources. This does two things--1) allows 80% of your resources to flow to the GW with ZERO traffic. 2) allows enough workers to get to the GW before phase 2 starts so that there is very little delay for construction to start. You should be able to delete the stub after construction has begun. If it stalls again (it shouldn't), just re-add the stub to get it started. Why remove the stub? If you are concerned that using the Freeway Mod might cause rollbacks or processing issues, you can remove it (and disable the mod). Otherwise, just leave the stub. We hope this helps you out! Did it work or did you run into problems? Leave a comment below so we can learn from each other's experiences and confirm whether or not it's working on every map. OMG- EA finally sees the user database in simcity and starts working on it :) I hope they do more- this game is really intense. I knew something was going on- I was in V. Woods last night and a user built a Space Center and it works ! Go to Whitewater Crossing and connect the North-East corner from inside the map to the Space Center using the Regional Freeway connector and restart your game. People begin flowing in shortly thereafter. This is ridiculous. EA/Maxis need to fix this. The mods won't load. I have CoT, if that might help. It's not zipped up so you don't need to do anything to it. Just place it in C:\Program Files (x86)\Origin Games\SimCity\SimCityData and you're all set to go. And your work-around is perfect !! Do these mods work for Mac? How can a Mac user fix these issues? the freeway mod doesn't work. Any new place its uploaded? You only need to add the road segment in one city. Add the segment and then let it run for 20 minutes and the GW construction should start up. Hi i build the road but it doesn't work. I wonder if i have to create some unemployment? Beside the freeway road only appear in 1 city. When i move to another city, it seems like i haven't built any road. As long as you draw a new intersection out in front of the GW (using the mod), it should work. Employment numbers shouldn't matter. If you switch cities, make sure to rebuild the road... it saves with whichever city you have loaded, since you are building the "regional highway" with that specific city loaded. It doesn't actually put the road on the region, it just lets you build roads out there in city-view mode, which means they are bound to the city's save, and not the entire region.